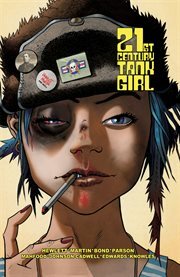 The item 21st Century Tank Girl, Issue 1-3, (electronic resource) represents a specific, individual, material embodiment of a distinct intellectual or artistic creation found in Lawrence Public Library. After a break of 20 years, Tank Girl co-creator Jamie Hewlett (GORILLAZ) is back! His first comic in decades is crazy, revolutionary, mind-altering, and beautiful. In 21 Tank Girl, Jamie rejoins writer Alan Martin and six other artists (some Tank Girl Stalwarts, some newcomers) to produce a book of epic stupidity. This is Tank Girl for a new age. Get your head down, put your hands over your private parts, and prepare for a relentless onslaught of comics, pin-ups, poems, short stories, and needless random carnage!